There is so much to celebrate about Halloween: the mystery, the adventure, the thrill and the creativity. This Halloween playlist is all about fairies - the agents, in my opinion, of the magical part of the festival. Have you ever wondered how the first jack-o'-lantern was created? Here is a tale of baker’s son named Garrith, who — with the help of a magic seed and an enterprising fire sprite named Jack — transformed a simple orange squash into a sparkling, magical lantern that charmed an entire town. Sam Sugarpop is a frisky little fire sprite who loves loves loves sweets: “for breakfast, for dinner, for supper and tea” as the nursery rhyme goes. When the children of the world hear his rhyme and also get a taste for sweets, a Halloween tradition is born: trick or treating for candy! Enjoy this three part So Many Fairies story following Henry, a first grade boy who wishes he were an elf. Part One: We meet Henry - a creative, delightful boy who would very much like to be an elf. When the Halloween season begins, he throws himself into preparation, for this year he will get to try on his elf-ness! He also meets Brie, a classmate who invites him to trick-or-treat in her neighborhood. On Halloween eve they immediately see that this is no ordinary Halloween: Henry-the-Elf and Brie-the-Cat discover a "Story House," and the adventure begins. After a month of enjoying all sorts of “trial runs” with errands, festivals, trips, and projects, brother and sister decide that they really want to bring in something new to their Day of Rest — a new tradition that they haven’t experienced yet. 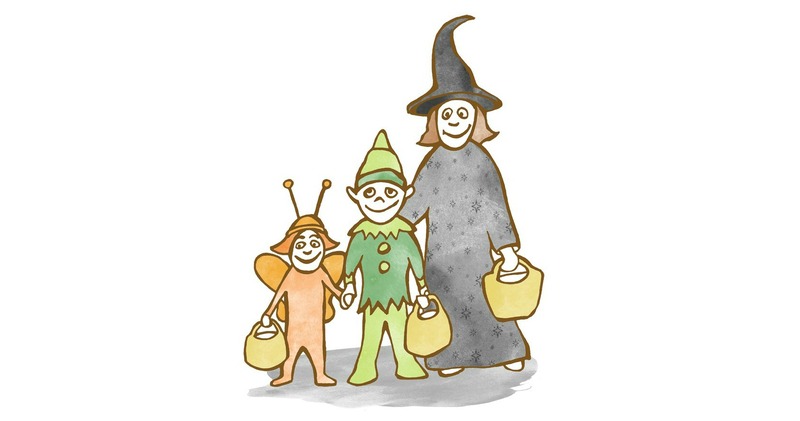 After the family spends some time “trying on” all the natural transitions of October, they realize that the month holds a special quality — something “in between” — which gives them a magical clue to exactly the type of thing they decide to add. The stories follow the events that unfold over the few days before Halloween as the creative brother and sister prepare for their annual Fairy Ball! Part One: "The Thinning of the Veils" While Martin and Sylvia wait for the invitations to arrive for their annual Halloween Fairy Ball, Sylvia spies something curious sticking out of the toy shelf in their bedroom. She examines it, and finds that it is an orange piece of paper with a drawing — and on the drawing is a red “X.” Martin declares that it must be a treasure map! And thus brother and sister are launched on a cross-town treasure hunt. Where will it lead them?